1.0–2.0 mm diameter grain size. A revolution in reef-keeping! This is the one you’ve been reading about in all the hobbyist publications. This grade of aragonite is specifically engineered for plenum-type nitrate reducing beds or anywhere a deeper bed is called for. The pore water space created by precision grading also allows maximum pH support and dissolution of calcium carbonate. Use our CaribSea-powered calculator to find out exactly how much sand you need. Needs a LOT of rinsing, but once rinsed works great. In my previous aquariums I have used a wide variety of substrate. I purchased 80lbs for my new 75 gallon aquarium. The dry aragonite special grade is a great size and color. It does not blow around like lots of sands or smaller sizes and very easy to work with. I do recommend THOROUGHLY rinsing the substrate before adding to your aquarium. I would not go smaller in granule size for a reef. This has great color as well. Large enough that my gyre doesnt blow it around. My wrasse seems fine burying in it. Came pretty clean. Dint fog my tank at all after washing it. appearance, good particle size for bottom dwellers. must rinse to remove dust unless you want to do it "in tank". personal preference. i used this for 2+ years in my first tank and just bought 80lbs for my new tank. I rinse mine to get the dust out so when I put it in it is clean. great for gobies. does not blow around and mound up under good flow. 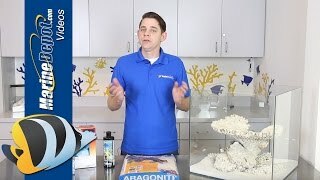 Finally a substrate perfect for a reef aquarium. This stuff is amazing. Rinses relatively easy and stays put in your tank! Looks great but won't blow around. Great sand for a high flow reef tank.